Sure, the MacBook Air 2011 can’t drive dual displays through Thunderbolt, but that doesn’t mean you can’t have two or even three external displays powered by the ultra portable if you get creative. The focus is on the MacBook Air here, but you can apply all of these solutions to any other Mac too. 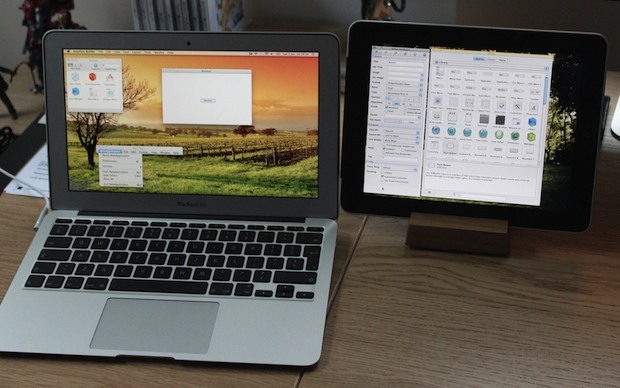 If you are determined to use dual external displays on the MacBook Air there are a few options available. The first is how everyone was using dual-external screens on MacBooks and MacBook Pros for a long time, connecting the first external screen to your standard Thunderbolt/MiniDisplay output, and then utilizing a USB to DVI display adapter to power the third display. These USB to DVI adapters work but they are slower, so you wouldn’t want to play games or videos on the screen powered through the USB adapter. Both of these pictures come from our ongoing Mac setups series. Need More? How About Three External Displays? Now if you wanted to get technical about it, you could actually drive three external displays from a MacBook Air by using all of the solutions mentioned above: a standard Thunderbolt display for one, a USB to DVI adapter for another screen, and the DisplayPad iPad solution for the third. Factoring in the MacBook Air’s (or any Macs) built-in screen, and you’d have a grand total of four displays to work with. That’d be a ton of screen real estate (don’t forget to set the primary display so the menubar is where you want it), and if you happen to go for that show-off solution please send us a picture and we’ll post it! I am all for helping someone promote their apps but this app has not been updated since Feb 2011. Sorry but this was a bad post. There are several other alternative iPad apps that perform the same function, DisplayPad was just the cheaper of the lot. It sounds like several of these need to be updated for full Lion support though. Surely somebody’s come up with a thunderbolt hub that would allow this. Together with ipad I get 4 displays where 3 work on full speed an one for chatting and so on. Hi – I’m located i North West part of Greenland. No. You can’t load any OS X onto an iPad. 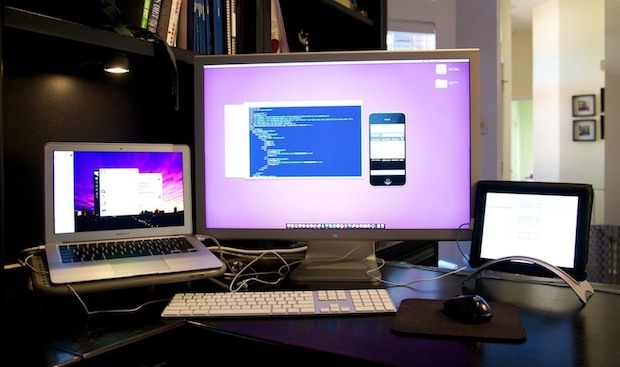 I have 3 external displays hooked up to my 13″ MacBook Pro (late 2009). I love it but I notice a few mild performance issues (ie. LaunchPad is nearly useless… it takes about a minute to show up if I launch it) probably due to an overworked video card. Or maybe it’s the two USB to DVI converters. I keep the MBP closed when using it with the monitors (use a HengeDock). Has anyone done similar that knows for certain the cause of this slight performance difference and if there’s any work around? Has anybody here actually run two fully functional external displays? I’m just trying to make it supports it without any “hacking”.